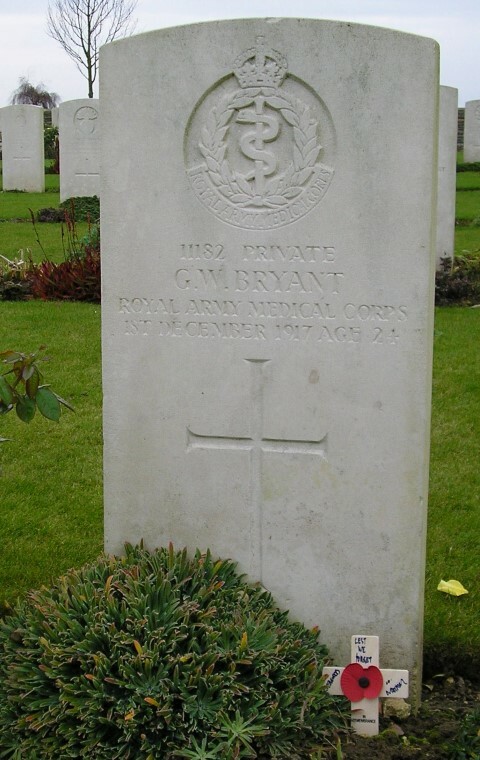 1182 Private George W. Bryant, 3rd Field Ambulance, Royal Army Medical Corps was killed in action 1 December, 1917 and he is buried at Metz-en-Couture Communal Cemetery, British Extension, France. He was 24 years old and is commemorated on Evenwood War Memorial. At this time, both James Richard and George lived with them. It is presumed that by the time George Bryant enlisted he had returned to the Witton Park area, possibly living and working in the rural part of the Evenwood and Barony Parish since he is recorded on the Evenwood War Memorial along with those men from the rural area of Lands and Morley. George Bryant enlisted at Bishop Auckland presumably into the Royal Army Medical Corps and was given the regimental number 1182. The service records of Private G.W. Bryant have not been researched. The Royal Army Medical Corps provided non-combatants who handled the evacuation and treatment of casualties. It was supplemented by the Red Cross, St. John’s Ambulance, Voluntary Aid Detachments and other groups. The Field Ambulance provided one or more Advanced Dressing Stations in reasonable proximity to the front line. It was under the command of the Division and was attached to an infantry or cavalry Brigade. The Casualty Clearing Station was the next stop on the evacuation chain for casualties. It was not part of the Divisional structure but part of the Lines of Communication unit. The hospitals (general and stationary) were the last stop. There were 61 locations including Amiens, Rouen, Abbeville, Etaples, Wimereux throughout France and Belgium. In 1914, each Infantry Division had 3 Field Ambulances, each of which was divided into 3 sections and each had Stretcher Bearer and Tented subsections. The Field Ambulance was composed of 10 officers and 224 men. B & C Sections each had a serjeant, 9 drivers and 3 batmen attached. An ASC driver for the cook’s wagon was also attached. As with all other units, the Field Ambulances relied heavily on horses for transport and had an establishment of 14 riding and 62 draught and pack horses. They worked the 23 wagons, 3 water carts, 3 forage carts, 6 GS wagons, 10 ambulance wagons and the cook’s wagon. The Ambulance had a single bicycle. Neither officers nor men carried weapons or ammunition. By the end of 1914, each unit also included 7 motor ambulances. A workshop to maintain them was added to the Division although in 1916 it was absorbed to the supply column. A Sanitary Section consisting of a Lieutenant or Second-Lieutenant, 2 serjeants, 2 corporals, 20 privates and 1 batman was added to the Division in early 1915 – its job was to maintain as far as possible clean water supplies, cooking facilities and billets. The Sanitary Sections came under Corps or Army control from March 1917 onwards. Various rest areas and local sick rooms. The Field Ambulances saw the full horror of war casualties. Many of the Casualty Clearing Stations located on or near to the battlefields established cemeteries near to hand. A typical example of the tasks undertaken by the men of the Field Ambulance is provided below. The 3rd Field Ambulance formed part of the 1st Division from August 1914 to August 1915 then was part of the Guards Division until November 1918. The Guards Division was regarded as one of the elite units of the British Army and has the distinction of being formed in France in August 1915 and remained on the Western Front throughout the war. The Guards Division was not involved in the first phase but formed part of the IV Corps of the Third Army for the second phase and formed part of the III Corps of the Third Army for the last phase. The service details of Private G. W. Bryant and the war diaries of the 3rd Field Ambulance have not been researched but it is assumed that since the 3rd Field Ambulance was attached to the Guards Division then Private G. W. Bryant was involved in the above engagements. The attack was launched at 6.20am, 20 November and the Tank Corps deployed its entire strength of 476 machines and initially met with success with an advance of 3 to 4 miles in a little over 4 hours at a cost of just over 4,000 casualties but the Third Army had failed to meet its objectives by the end of the first day. Fighting continued through the next week and the Guards Division were thrown into battle and advanced into Fontaine. Once the Germans had been driven from Bourton Wood, they switched artillery upon it and those battalions caught in the wood were wiped out. The Guards attacked the village of Fontaine Notre Dame but were beaten back and the Third Army closed down operations 27 November and units ordered to consolidate. Three days later, the Germans struck back. Many artillery batteries soon came within range of advancing German infantry and the Guards Division, still recuperating from a mauling in Fontaine Notre Dame, headed into a bitter fight to hold onto Gouzeaucourt On the 3rd December, Haig ordered a retirement and the audacious plan had failed although some ground had been gained, in places the Germans were now on ground previously occupied by the British. By 5 December, the line had re-stabilised. The Third Army reported losses of dead, wounded and missing of 44,207 between 20 November and 8 December 1917. Of these 6,000 were taken prisoner in the enemy counter-attack 30 November. Enemy casualties are estimated at approx. 45,000. One of the British casualties was Brigadier-General Roland Boyes Bradford VC, officer commanding the 186th Brigade aged 25 when killed 30 November 1917. He is buried in Hermies British cemetery. Private George William Bryant died 1 December 1917. He was awarded the British War and Victory medals. Private George William Bryant is buried at grave reference II. E. 20 Metz-en-Coutre Communal British Cemetery. Metz is located to the south west of Cambrai and was behind British lines from 4 April 1917 until 23 March 1918 then re-taken 6 September 1918. The British section of the cemetery was begun in April 1917 and was used until March 1918. The original burials made by the Field Ambulances and fighting units are in plots I and II which is where Private G.W. Bryant is buried. Soldiers Died in the Great War: Note he is recorded as being born at Witton Park.